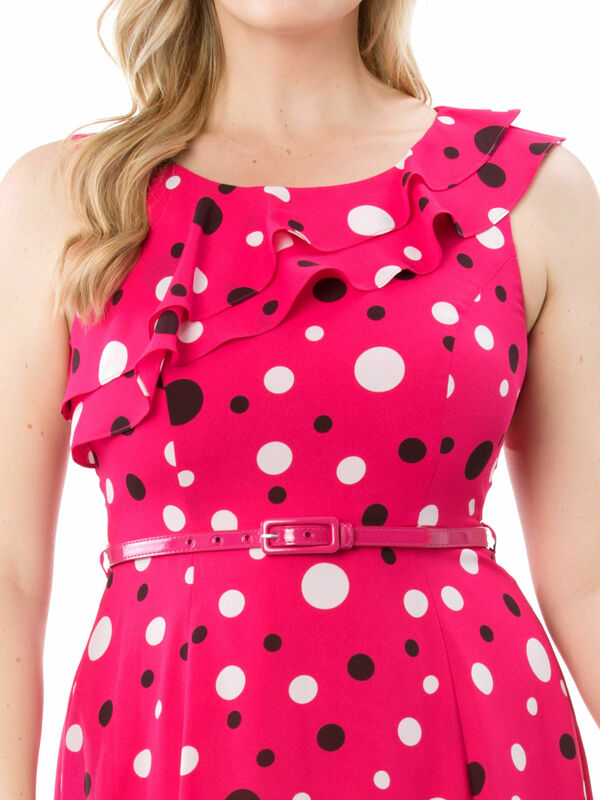 Belle Spot Dress https://www.review-australia.com/au/belle-spot-dress-watermelon/RE19DR177.REPNK110.html A party favourite any REVIEW girl will love, the Belle Spot Dress is bright, fun and flattering. The lightweight fit and flare style features ruffle frills, a relaxed soft pleat skirt, bold multi polka dot print and a removable patent belt at the waist. 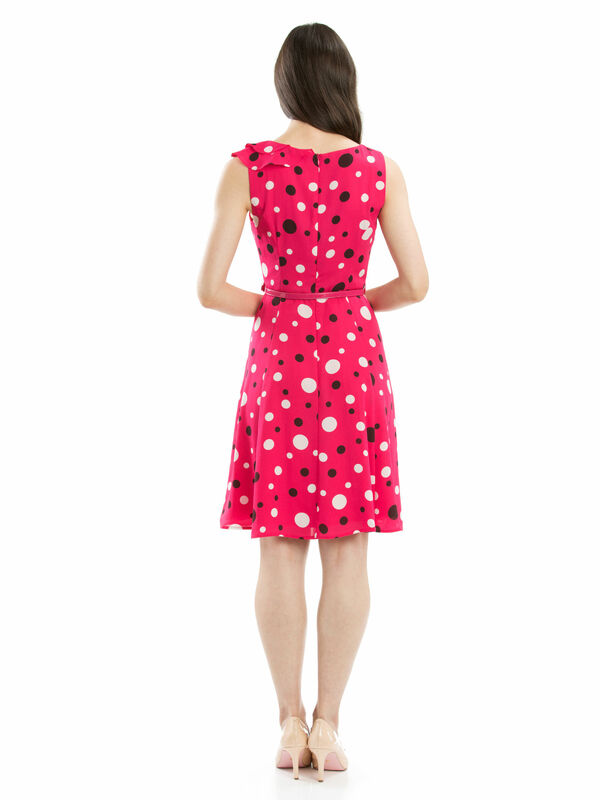 Belle Spot Dress is rated 5.0 out of 5 by 52. Rated 5 out of 5 by Blossom2 from Beautiful dress! I bought this dress during the Christmas sales, and I am so glad that I did. The dress is lovely and light - I live in north Queensland, and I can't wear heavy fabrics. I also dislike ironing, and this dress will never need it! Although the frill across the front might not suit some people, my figure is small enough that it sits beautifully across my chest, without becoming a hindrance. The colour is gorgeous, and I know it will be easy to dress this down for work, and glam it up even more if I want to go out in it. Rated 5 out of 5 by nachan from Beautiful, colourful and versaltile piece! I first saw this online and was attracted to the colours and the fit. When I actually tried it on instore, I fell instantly in love! It sits beautifully, is true to size and designed in a way that can be modified for casual, evening or work wear. A short blazer turns in into a powerful corporate outfit. Cheeky sandals make it perfect for date night and cute sneakers with a denim jacket set you up for almost any casual excursion. Rated 5 out of 5 by Lotus Lady from Feminine and pretty! I bought this dress to wear to a New Year’s Dinner. It was perfect for this event and I had lots of comments on his gorgeous it looked! It is feminine and flowery and looks good on a person my height (I’m only 152 cms) so is a great style for the petite girls. As is usual with Review dresses, it is beautifully constructed and feels amazing on. I love it!!! Rated 5 out of 5 by Jules from Feminine and Lovely to Wear I bought this dress for Christmas, New Year celebrations. Was just beautiful and light to wear in our current heatwave, and I felt very festive wearing this dress. This dress will also be used for work attire and going out on the weekend. Very elegant, soft, pretty dress. Rated 5 out of 5 by Jacinda from Bright & fun dress! I tried this on, not really expecting to buy it but this dress is so much nicer than expected when looking at it on the hanger. It is such a lovely bright dress! I also love that I can easily pair it with a black or white belt as well! Very versatile. Rated 5 out of 5 by Kariony from Beautiful fit and so comfy! I don't normally wear pink, let alone super bright pink or bold, bright prints that draw attention to myself - but this dress is fabulous. Cute with heels for work - or with flats on the weekend for a casual but classy look. Fit is also true to size.